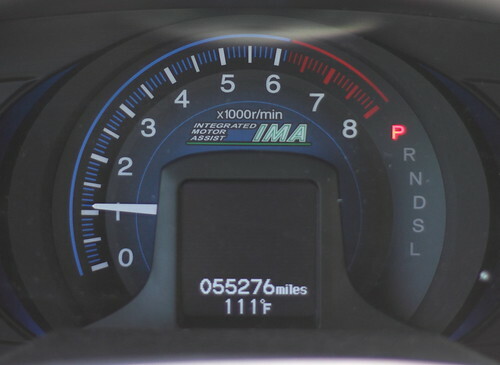 Does it make a difference that it’s a dry heat? Yeah, but not much. “You’ll have missed the best of summer by the time you go home,” a Highlands shopkeeper said mournfully, as we ducked into her shop to get out of the rain. Och, not a chance, missus. #3 – Don’t even so much as boil water indoors (except in the electric kettle) when the temps hit 93°. The one fly in the ointment is the curious trio of raccoon who have dug up the strawberry bed entirely (!!) and are quite interested in the camp stove and all of our outdoor doings – but fortunately opposable thumbs in this case don’t mean that they can cook. Because cooking and eating aren’t that interesting just now, we’ve gone into new experiments. 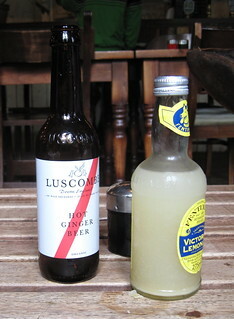 We had the MOST amazing ginger beer in Scotland, put out by a company called Luscombe in Devon, England. It’s made in a village called Buckfastleigh. Aside: Yes, let’s do take a moment and consider that name. Buckfastleigh. Ah, yes – this particular village in Devon also is home to BUCKFAST ABBEY, notorious makers of the hideously destructive delinquent Glaswegian crazy-fuel, BUCKFAST TONIC WINE, aka “Wreck the Hoose Juice.” Aye right, keep it classy, Glasgow. (Actually, that’s one of those names that was always in the paper – we never heard Actual People call it that. Notable to foodies seeking an aggressively comparable non-alcoholic drink in pubs, Luscombe’s Hot Ginger Beer burns all the way down, yet soothes the stomach. Not too sweet, with a crisp bite of lemon to sharpen the gingery glow, it is a perfectly lovely thing to drink to warm you up – or cool you down. They make a Cool Ginger Beer as well, but we hadn’t the patience for that nonsense. Ginger is supposed to bite. Sadly, not at all willing to pay $65 to ship a twelve-bottle case to our house (! ), we decided to put our intellect into finding out what’s in the stuff, and recreating it ourselves. Because, why not? Ginger beer is straight forward. It’s only ginger root, sugar, and water, right? Actual ingredients include spring water, organic raw cane sugar, organic root ginger 3%, organic Sicilian lemon juice 3%, brewers yeast and CO2. Those are the simple ingredients, and we’re pretty sure the CO2 also occurs naturally when the juice is bottled, as it is a byproduct of fermentation anyway. Ginger beer is a relatively old recipe from the times when water wasn’t always the best option to drink, and people drank small beer or ales. Ginger beer is actually very slightly alcoholic — you can’t really make it without naturally occurring alcohols cropping up. That’s an immutable fact of making a fermented beverage – and yes, the good ginger beer and root beer, too, is fermented and filled with those good-for-you lacto-bacteria, just like kimchee or soy sauce. The trick is to allow for naturally occurring alcohols, but not intoxicating alcohols, so it has to be watched and smelled and stirred daily. We began by processing fresh ginger root. In this weather, any fresh fruit or veg goes round pretty easily, so we found that chopping it up – skin and all – and freezing it assured that we’d have it as needed, and it thaws quickly and easily with no change in body. Originally, root beer was made out of …um, roots and molasses. 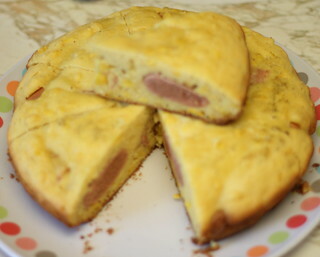 We compromised on a variety of recipes and chose one we liked. In these containers are sarsaparilla root, ginger root, licorice root, a cinnamon stick, and juniper berries; wild cherry bark, hops flowers, a 1/2 c. of “ginger bug;” wintergreen leaf, birch bark, and dandelion root. 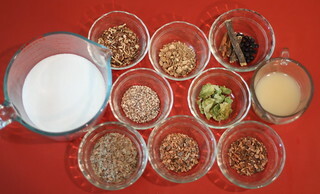 This is the basics from an 1840 recipe for root beer. Hops are bitter, and they’re what’s in beer to make it bitter, so T. was fairly skeptical about their inclusion… and since we had no brewer’s yeast, we used fresh yeast from the bakery. This… may have been a mistake. Next time we plan to include sassafras root (we accidentally ordered sassafras leaves, which are great for including in gumbo, but not so much in here) and molasses, and a kefir starter, which hopefully doesn’t smell quite so …raw. The fermented soda experiment is ongoing, but a few things have been learned. First, OPEN ALL BOTTLES GENTLY and IN THE SINK. We had a root beer tsunami the other day, and it wasn’t pretty. The amount of CO2 collecting under the the lid of a bottle can have fatal force – open away from you, just like you would shaken soda, or champagne. Second, lemon juice is brewed soda’s friend – it adds a lot to the blurry medicinal flavors of roots in the root beer, and helps to sort of …cut the raw, yeasty smell. Thirdly, there is a hair-thin line between healthy fermentation and hooch — on hot days, things may go TERRIBLY wrong, very quickly (this hasn’t happened to us yet, but we’ve been warned all over the place about exploding bottles and out-of-control fermentation. We are not making booze! Promise, Mom.) 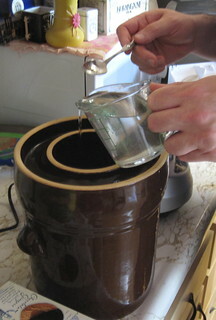 Finally, we’ve learned that though we are willing and eager, making homemade root beer is going to be harder than we thought – the flavor we’re chasing is elusive, and the smell is off-putting to everyone, even veteran booze-drinkers (D took some to work for his coworkers to taste. 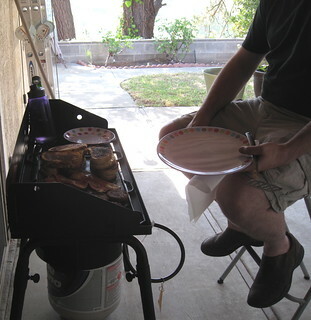 Once they got past the smell, they all said it was good; T and Niecelet Flea said a definite thumbs down). We’ve concluded that Americans don’t really drink “root beer” so much as they drink sarsaparilla – the flavor of ours was nothing like root beer, except the one time we got root beer from a health-food store and were horrified. We’ll be aiming more for sarsaparilla next time. The ginger beer is definitely easier for first-timers. We rather like the ginger beer – though T says it’s nowhere near as strong and lemon-y as it should be, and since she drank various brands everywhere everyone else had a diet Coke, she ought to know. T suggests dried ginger root will be added in copious amounts next time, along with fresh, to the ginger bug, and and lots more lemon juice in continuing incarnations. Stay tuned! Hope you’re finding ways to keep busy and creative in the hot weather – or the wet weather – or wherever you find yourself. Savor every day of summertime – too hot, or not. Life doesn’t resume when it cools down or heats up, or is some ephemeral right temperature – it’s right now, so enjoy. The words “artisan” and “vegan” go together. Well, they’re being seen together a lot more lately, anyway. Honestly, it was only a matter of time before vegans figured out the cheese thing, since it’s the excuse most of us use to stay not-vegan. We love our cheese. For those who desire to switch to a solely plant-based diet, the siren-call of cheese can be really, seriously, awfully HARD to resist, so vegans have for a long time been motivated. Of course, there have been, and there remain, myriad vile concoctions as a result of that motivation, horrific things which masquerade as cheese. Probably everyone has their story of struggling through plastic-y sandwich additions, crunchily textured things made out of rice milk (WHY?) and bright orange “chezie” sauce on pasta (sometimes this can be really good – T’s baby sister makes an amazing mac-and-cheez. But, not everyone has the knack. ), but this isn’t a story about someone’s putting out a substandard product. This is a story of a product cheeses which was welcomed by vegans, vegetarians and omnivores alike. It was kind of shocking. 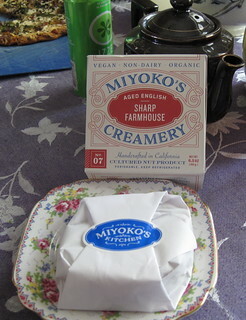 Miyoko Schinner is a longtime Bay Area vegan who wrote several cookbooks, including one in 2012, detailing her at-home success in making cultured vegan nut products. But, though many people bought the book, they were too timid to try cooking with unusual ingredients such as carrageenan powder, xanthan gum, tapioca flour, and agar powder. Not only that, but people had to come to grips with stuff like rejuvelac (what?) and the idea that culturing anything – dairy or non-dairy – is a process that is open to the vagaries of chance, as well as time-consuming. 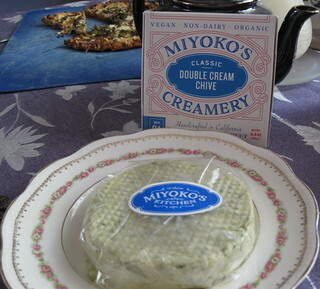 Laziness won out again, and after a lot of whining from friends and family, Miyoko opened Miyoko’s Creamery… which now ships to all fifty states, has a contract with the Whole Foods Markets and is still expanding as we speak. We sat down for our family “Wine & Cheese” Tasting last week with a chilled bottle of Draper Valley Riesling grape juice – from an absolutely fabulous company which produces only unsulphured bottled grape juices, which means everyone can partake – and four of Miyoko’s Creamery cheeses (and, we’re just going to say “cheeses,” because “cultured nut products” makes us want to belt someone, and we refuse to type that umpteen million times). The cheeses are plastic-wrapped and then boxed for freshness, and before tasting, T. set them out for about forty-five minutes, to make sure we lost none of the flavors due to cold. (We don’t advise more than ten minutes in the summertime, however! The Double Cream got very soft.) There are ten “root” varieties of cheese, and then there are seasonal variations. We chose the Aged English Farmhouse cheese, the High Sierra Rustic Alpine, the Fresh Loire Valley in a Fig Leaf, and the Classic Double-Cream Chive. In the interest of taking good first impressions and comparing and contrasting, we ate the cheese on thin crispy, crackers containing no spices, passing the plate along the table and comparing flavor and texture, smell and noting anything else which caught our attention. Interestingly, the ingredient list for the second cheese we tried is identical to the first, and yet, could two cheeses be any more diverse? The Classic Double Cream Chive was very nearly T’s favorite, with its creamy, mild, buttery flavor and the lovely hint of chive. In color, it is a creamy white, with bits of green which are the chives. This was enthusiastically received, and T. imagined it on baked potatoes, immediately. And then on toast. And then on peppered water crackers… Despite the miso and nutritional yeast still present in this cheese, the overwhelming flavor is mildly herb-y and buttery — like a nice Gournay cheese like Boursin. T’s mother returned to this cheese as well, as it’s very creamy and moreish, as our Scots friends would say. Another plus? It a cheese that is definitely easy to get kids to eat. Our youngest taster, Elf, is eight, and informed us that it is indeed a very good cheese, and he’s quite the omnivore and picky as all heck. An excellent result! Not surprisingly, because T. loved it so much, D. just… shrugged. “It’s fine, it’s tasty enough,” is no ringing endorsement, so we will just ignore him, and move on. AHEM. The next cheese T. wasn’t too sure about at all – because she’s not that fond of fruit in cheese, and not always at all fond of certain varietals of figs. Fortunately, she needn’t have worried; the ingredient list remained the same with this cheese, which meant the fig leaf – wine-cured – was only on the outside, and had nothing to do with the product INSIDE. 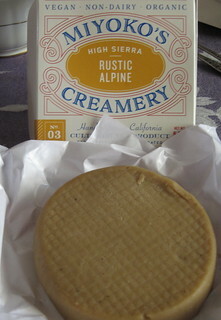 The manufacturer has made a note that the shelf-life of this particular cheese is sixty days. As none of our other cheeses had this note, we figured it was there because of the leaves, which introduces another biological element into something cultured and aged. While T. wasn’t sure she’d be wild about this cheese, this one D. managed to hoard and keep right in front of him on the table. Its sharpness and decidedly tangy, savory flavor may have been the reason for this. 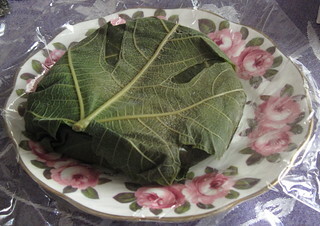 In color, this product is creamy white and the leaf only discolors the surface a very little bit. The manufacturer advises that this cheese grows more sharp as it ages. Of all the cheeses we tried T. liked this one least, and D. liked this one best. Elf was indifferent and T’s mother tried it once or twice, and remained enthused. The final cheese was a second choice; we’d intended to sample the Smoked English Sharp Farmhouse, but it is apparently wildly popular and goes quickly out of stock from week to week. We settled instead for the Aged English Sharp Farmhouse, and were nonetheless thrilled. It is a firm, light tan cheese with a tangy flavor reminiscent of cheddar, and would have paired nicely with a Draper Valley verjus, the tangy, tart vintner’s brew made of unripened grapes. We all immediately imagined this melted – and it does melt – into a pasta sauce. This was Elf’s hands-down …tied favorite. Flea’s hands-down main favorite, T’s mother’s favorite, just because they all were, D’s second favorite, and T’s favorite. While we tried to remind ourselves that we were just TASTING, this cheese barely made it to be wrapped up and sent out the door to T’s parent’s house. Given time, it would have been completely snarfed down. The ingredients for this farmhouse were the same as with all of the other cheeses, yet this astonishingly tasted nothing like them. At all. …which is really not so surprising. ALL cheeses in the dairy section are, at their root, made of … milk, salt, and enzymes, added with time. What gives cheese its flavor differentiation? The culturing process. The time. Owing to that simplicity, you might having a niggling interest in buying that cookbook and seeing how hard it would be to produce your own cultured nut products (!) at home. Or, if you’re not as time-rich as that, you could pop over to the website and see what else you’ve missed. 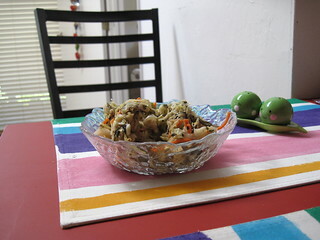 The Country Style Herbes de Provence? The Double Cream Sundried Tomato & Garlic? 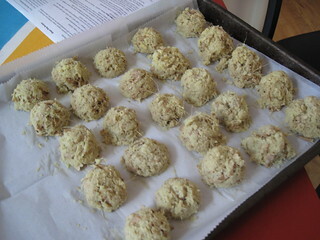 The French Winter Truffle, or the Mt. Vesuvius Black Ash? We bought these cheeses to share a social experience with vegans who don’t often get to have wine & cheese parties (okay, not gonna lie; people who don’t drink also don’t have wine and cheese parties, but we’ll ignore that), and came away sort of gobsmacked and perfectly willing to buy and consume these products our own non-vegan selves. There are still plenty of vegan “pitfalls” out there in terms of faux cheese products — but this carefully handcrafted, artisan “cultured nut product?” Is not one of them. If you’re vegan, you may be shrugging and thinking, “Well, that’s all very nice for the sanity of the omnivores, but…” Nope, think again: probiotics exist in fermented foods of all kinds, even those which have no milk products. An easy one to enjoy? Kimchi. By fermenting vegetables in a salty broth to suppress the whole decay factor of vegetables sitting in water for weeks at a time, lactic acid bacteria takes over the process, creating the magical healthy probiotics that we need. 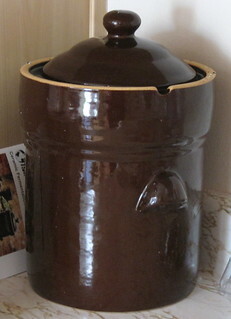 T’s family had many Korean friends, and growing up, T. ate some really amazing kimchi. T. has a vague memory of her mother attempting to make her own kimchi in a Mason jar… and the Mason jar exploding… so when D. wanted to make kimchi, T. was… not really on board. So, she stalled. This worked for a few weeks until D. found a fermentation crock, and then the whole kimchi thing was on like Donkey Kong, and there was nothing she could do about it. She wasn’t sure what to put in it – some traditional recipes call for shrimp – ugh, imagine that decomposed – and there’s the traditional red pepper powder called gochugaru — kimchi aficionados say it can’t be replaced with just plain cayenne pepper. Nevertheless D. had a new toy, and in went the Baechu (napa) cabbage, red peppers, onions, scallions, garlic, chopped carrots, and crushed roasted seaweed, to add a bit of meaty umami flavoring – the “rocks” to hold down the veg, the water and the salt. 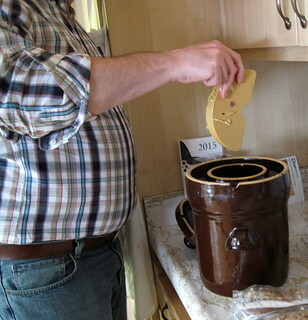 Adding salt to our fermented cabbage this time was …tricky. The first recipe we used added it by weight, and we made the mistake of looking for a “vegetarian-friendly” recipe instead of looking for a KOREAN recipe. Rookie mistake, we are covered in shame. There’s a method to making this properly, and the first is to brine the cabbage – and then rinse it. This is necessary to kill off nasties, but rinsing also helps keep the level of salt down. We had to back up and do this step after we had a delicious but ultimately waaaay tooo salty dish. The second trick is to mix your seasonings into a paste and add it to the cabbage only after it’s all together. That way you can get delicious ginger and garlic and peppery goodness in every bite. From various studies, kimchi aids in digestion, lowers total cholesterol, is an antioxident, reduces inflamation in skin breakouts, lowers BMI, beefs up the immune system, reduces oxidative stress in blood cells, inhibits the growth of cancer cells, increases glucose tolerance, especially when eaten with a low fat food; inhibits gastric ulcers, combats nutrient depletion, builds stamina and helps prevent yeast infections. Are we at least a little more on-board with this? Hope so. Tune in ’til the next Feat of Fermentation. *Yes, yes, we know we’re bizarre. Normal people are talking about their home microbrewing when they discuss fermentation. Haven’t you figured out by now that we’re never Those People? Get with the program, folks; even when we’re swanning around in the sky we don’t do “normal” here.